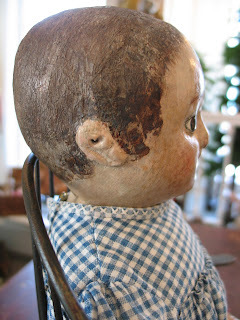 Yesterday was a wonderful day for me - I went to Lucy's Doll House in Camden, Maine to visit. 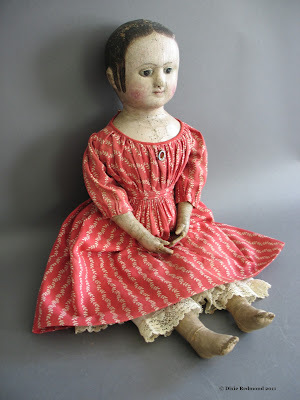 they have so many wonderful, wonderful dolls there. 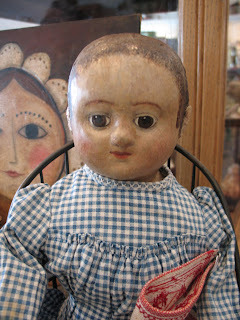 I visited a beautiful Columbian doll there, and checked in with a favorite Babyland Rag doll, and of course, I visited with the Blue Izannah. 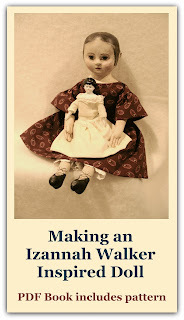 But it was a bit bittersweet, because this Izannah Walker doll has been sold and will be going to her new home soon. I have been so thankful to be able to travel and see these dolls. But now I will have to travel further afield - my family has a plan to take a drive to the Shelburne Museum in Vermont, and maybe I can convince them to go on down to New York to the Strong Museum, and from there go down to Rhode Island, then maybe loop up to the Wenham Museum...wouldn't it be fun to make an Izannah Walker Doll Pilgrimage? Hello, Dixie! 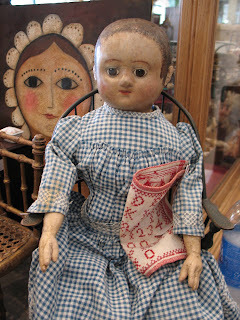 There were two Izannah Walker dolls for sale at the Rosalie Whyel doll museum in Belingham, WA near Seattle a few years ago. At that time they were priced at $16,000.00. I held one so that I could have contact with the great Izannah. I appreciate your Izannah Chronicles!